Sports betting is simply the act of attempting to predict sports results while placing a wager on the outcome according to an agreed upon set of rules or laws. That wager can be made either against another single sports bettor such as yourself, against a "house" or bookie, and even involve multiple prognosticators such as playing the weekly office pool. The allowable forms of legal online sports betting may vary drastically from one state or country to another, and wagering on sports events on the internet has become a popular, multibillion dollar industry. Legal betting online has taken off on multiple levels, with sports betting being one of the most popular legalized options available. Naturally, the most commonly wagered on events include football, basketball, and baseball. The comprehensive sports betting sites that we feature also offer a wide range of betting lines that cover both popular sports niches as well as some of the more refined, less popular types of events. You may even find yourself interested in a sports category you really never knew much about until now. Yes. There are no US federal laws prohibiting US residents from betting on sports through online sportsbooks that are legitimately licensed and regulated outside of the United States. There are two states that specifically prohibit all online gambling regardless of the legal status of the destination: Washington and Connecticut. Thanks to the 2018 repeal of PASPA, individual states may now determine the legal status of both online and offline sports betting within their borders. Several states have already passed legislation authorizing state regulated sportsbook gambling with some of them including domestic online sports betting within their range of legal betting activities. We expect to see the expansion of domestic sports betting continue through brick and mortar sportsbooks and online sports betting sites. Bovada Sportsbook is the largest and most trusted site who caters exclusively to US players. Their parent company "Bodog" has been around since the inception of online gambling and they've earned a sterling reputation in that time. Bovada is licensed and regulated in Canada. 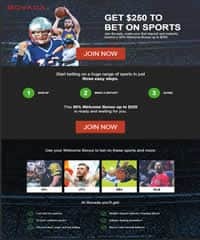 Bovada offers new sports players a generous 50% signup bonus up to $250 on their first deposit. Players can also claim their incredible $3,0000 casino bonus in conjunction with their sportsbook bonus. Bovada does a great job saying thank you by offering competitive bonuses and perks to both new and existing players alike. And they pay out winners like clockwork which is why they've grown to be the largest and most trusted site. The following sportsbooks all accept U.S. players and are legally licensed do do business in their respective jurisdictions. They are also some of the most safe and reputable sites you could choose to bet on sports if you live in the United States. Is It Illegal To Bet On Sports In The United States? No, online sports betting is not illegal in the United States. Licensed and regulated offshore sports betting has never been prohibited at the federal level, and only two states currently impose restrictions for this form of betting entertainment. The US friendly offshore sportsbooks you see on this page are all legally sanctioned and operating legitimately within the industry. The Professional and Amateur Sports Protection Act (PASPA) was a federal law that prevented domestic sports betting in most of the USA for 25 years, but in May of 2018, the Supreme Court voted in favor of sports betting 6-3 when they ruled that PASPA was unconstitutional. This made it legal for states that were not previously exempted from the law to pass legislation to allow state-regulated sportsbooks to operate inside the USA. Now that there is no federal ban on sports betting, several states have already passed sports betting laws including New Jersey, New York, Pennsylvania, Delaware, Rhode Island, and Mississippi. More states are expected to follow suit and many people think at least half the states in the US will have some form of domestic sports betting in the next few years. Where Is Sports Betting Legal In The USA? Sports betting has the potential to be legal in all 50 states given the recent SCOTUS decision that repealed PASPA. Just like online casino and poker gambling, states must vote in legal sports betting. Several states such as New Jersey, Delaware, West Virginia, and Mississippi have already passed legislation on legal brick-and-mortar sports betting and have launched their domestic sports betting operation. It is possible that some states choose not to legalize sports gambling options. Licensed offshore sports betting will still be legal regardless of whether or not your state has legal regulated options available (unless a state passes legislation explicitly mentioning offshore brands as being illegal). We will keep this page updated on which states offer locally regulated sports betting options. Several US states have enacted legal sports gambling legislation which has allowed the state to regulate and tax sports betting operations. Nevada has long had the capability to offer sports gambling even during PASPA's rule over the US. States like Mississippi, West Virginia, New Jersey, and Delaware have all passed sports betting legislation in 2018 and launched their sportsbook services in the same year. Pennsylvania and Rhode Island also passed sports gambling legislation in 2018 but have yet to launch their operations as of November 2018. New Mexico tribal casinos have recently begun offering sports betting services despite the state without legislation to regulate sportsbooks. While the following states haven't all passed laws to legalize sports betting, they also don't have any laws that specifically ban it either with the exception of Washington state and Connecticut, both of which ban all forms of online gambling regardless of the source. Though we don't know of anyone that has actually been charged for the act of online gambling in either state. So as we explain all throughout our website, with the exception of WA and CT, players residing in any of the following states can legally bet on sports via an offshore sportsbook that holds the proper credentials. *Click on the states below to see sports betting laws. What Federal Laws Affect US Sports Betting Options? We are pleased to say that the 2018 repeal of PASPA has minimized the federal government's hold on domestic sports betting. The Federal Wire Act does prevent any state-regulated sportsbook from accepting any bets across state lines, but this is now the extent to which federal law places restrictions on the industry. Individual states now have the authority to dictate their regulations, restrictions, and prohibitions concerning sports betting. We have seen multiple states embrace this new freedom by passing legislation to authorize state-licensed sports betting, including online betting. Most industry insiders expect the expansion of domestic sports gambling to continue. Before PASPA's repeal, the Federal Wire Act prohibited gambling through an electronic means or by phone. When this law was established, bookies were set up by the mob and were running illegal gambling operations in excess. This law was the method by which law enforcement could put an end to these operations. While the law was previously used to prevent US-based online sports betting, the law now simply restricts interstate wagering. Now that state-regulated sports gambling is no longer prohibited by the Professional and Amateur Sports Protection Act, the application of the Wire Act changed significantly. However, in 2019 the DOJ revisited their stance on the Wire Act from 2011 and deemed it necessary that gambling businesses and states licensing these services must make their operations completely intrastate and were given 90 days to comply to this new standard. Some states are ready to sue the new Opinion. What Was The 1992 PASPA Law And How Did It Affect Sports Betting Legalization? PASPA, or the Professional and Amateur Sports Protection Act, prohibited 46 states from offering any type of regulated land based betting options. The law was passed in 1992 and exempted Nevada, Oregon, Montana and Delaware. These 4 states already had some type of sports betting available so they were grandfathered in. All other states had a year to pass legislation that introduced regulated betting, but none did so. For over 25 years, PASPA limited these 46 states from introducing any type of sports betting. Even the 4 exempted states could not introduce any new type of betting that wasn’t present at the time of PASPA’s enactment. Only Nevada featured single-game wagering options. PASPA was repealed by the SCOTUS in 2018 and now each state can choose to legalize or prohibit sports betting at their pleasure. How Did PASPA Come Crashing Down? Over time, sports betting grew increasingly popular and the demand for legal betting options grew. New Jersey attempted to circumvent PASPA by passing legislation that authorized its existing casino locations to offer sports wagering. The state was sued by the major sports leagues and the law was shut down by the federal government. New Jersey decided to appeal the government’s action. They lost multiple times in lower circuit courts but somehow landed an audience with the US Supreme Court. SCOTUS opened the case in December 2017 with oral arguments. After months of deliberation and testimony, SCOTUS ruled in favor of New Jersey and deemed PASPA unconstitutional. The law was repealed as of May 14, 2018. This means that the 46 states once blocked by PASPA can now vote in legal sports betting should they choose to do so. The third and final important gambling related law in the US is the UIGEA law, also known as the Unlawful Internet Gambling Enforcement Act, which does not affect the legality of player participation in online gambling, contrary to popular belief. This law, in fact, provides regulatory oversight concerning how online gambling transactions can be processed. The Act does not address or target players in any way, nor does it prohibit US players from enjoying online gambling options. The UIGEA is directed at online gambling site operators and payment processors, and attempts to establish a safe and secure environment for processing gambling related transactions free of fraudulent and money laundering activities. When Is Regulated Sports Betting Coming To The USA? In 2018 the Supreme Court of the United States ruled that PASPA was unconstitutional and opened up the doorway for states to enact their own sports betting laws and regulations. Since the ruling, several states (Nevada, Delaware, New Jersey, Mississippi, West Virginia, and New Mexico) have already begun accepting bets on sporting events and more states are expected to legalize domestic sports wagering in early 2019. Pennsylvania and Rhode Island have also passed domestic sports betting bills but as of this writing, they have yet to launch. At least 18 other states have a pending sports betting bill that will need to pass before domestic sports betting is legal in those states. Will I Get Into Trouble if I Bet On Sports at Online Sportsbooks Regulated Outside of the United States? As long as you limit your sports wagering to legally licensed and certified sports betting destinations on the Internet which are subject to genuine regulatory oversight by a respected governing jurisdiction, then you will not be breaking the law. The online sportsbook brands recommended throughout this guide have been carefully vetted by a team of analysts, and are all licensed and compliance certified to offer their sports wagering services to players in the US and around the world. Online sportsbooks employ at least one incentive to try to attract customers whose history can be traced back to the "house comps", or complimentary bonuses, that started in Las Vegas at traditional brick-and-mortar casinos. These sportsbooks will often times offer a welcome bonus matching a percentage of your initial deposit when you open an account. For instance, a particular sports betting site may offer an extra $25 for every $100 you deposit as a way of saying thank you for favoring their company over another. With approximately $10 billion wagered on the National Football League Superbowl globally every year, much of it online, it is easy to see why websites are happy to spend money to attract customers. When coupled with the 24/7 access and worldwide reach of the World Wide Web, this generous welcome bonus offers an attractive advantage over physical land-based sportsbooks. And for those sports lovers who enjoy the excitement that sports betting can provide, but do not have a physical proximity to a brick-and-mortar sportsbook, the Internet provides a simple answer. There are also financial and time considerations to be made when you plan on wagering in a land-based casino. These considerations simply do not exist in the current world of wagering online, and help drive the global multibillion dollar business in its current state. The most common form is the "straight bet" that allows for wagering against a spread. The spread, or line, is a number created by online sportsbooks and offline bookmakers used to handicap one side of a wager, while favoring the other. If one basketball team is significantly better than another, the weaker team will be given points to even out the betting. Those points, or spread, are then added to the weaker team's point total at the end of the game to determine a winner. Other popular sports betting types are parlays, teasers, proposition bets, and totals. Betting online has truly become one of the most popular venues of online entertainment. Following are some of the niches that make up the most popular betting lines found at most sports betting sites that accept USA players. You can check for up to date player and team stats, game schedules, latest news, and more. All this information will assist you in making informed wagering decisions. The recommended sites you see above also provide great statistical information and the latest news on the players and teams to help you in your wagering options. Legal Online Football Betting - Who doesn't want to enjoy some legal football sports betting action on the most watched event in sports....the Superbowl! Legal NFL Online Betting - NFL Season is one of the most anticipated sports seasons covered by sports betting sites, so signup with one of our recommended sportsbooks to bet on the NFL this season. Legal Superbowl Betting - The Superbowl is the culmination of the entire season's activity and is one of the most watched events on television each year. We'll provide you with access to current odds and legitimate, trusted sports betting options. Legal College Football Betting - College football fans are some of the most serious sports bettors participating in online gambling. Our guide will provide you with helpful information to make informed wagers. Legal Online Basketball Betting - Millions of die hard basketball fans eat, live, and breath NBA and NCAAB action. Our guide offers some great content and recommendations on where to bet on USA basketball legally. Legal Online NBA Betting - Check out our list of the best sports betting sites that offer legal NBA betting options. Legal Online Baseball Betting - The World Series is an event that you see lots of betting line options for, from player and team props to live betting. Legal Online MLB Betting - Check out which sportsbooks offer legal MLB betting and the best lines in baseball. Legal Online Golf Betting - Golf enthusiasts can wager on golf matches legally. Learn tips and more in our informative golf wagering guide. Legal Online Soccer Betting - Soccer is actually the biggest spectators sport on the planet. It's just not as popular in the United States as it is abroad. However, there are plenty of soccer fans that will appreciate our guide that includes the best soccer betting sites as well as tips that will help you win. Legal Online Nascar Betting - Nascar is a very popular sports in the United States. And it's fun to put a sweat bet on a particular race. Learn which sites are the safest to place your wagers with and which sites offer specific Nascar wagering lines. Legal Olympics Betting - The 2016 Rio Olympics is just around the corner, and we've updated our guide to include the most reputable USA friendly sportsbooks that offer betting odds for the summer Olympics. Legal Bitcoin Sports Betting - We just launched our Bitcoin gambling section which is a very thorough guide into how to use Crypto Currencies and whether or not Bitcoin gambling is legal in the US. For online gambling participants who enjoy action on various betting verticals, check out your options for legal poker sites and USA legal casinos.